My Marey tankless water heater will be installed in the attic, just to the left of the fresh water tank. The Marey will sit inside a cabinet and extend upward clear of Box Van's ceiling. A vent will go thru Box Van's roof for the Marey's fumes. I've constructed the cabinet where the Marey water heater will be located. The pic below shows the frame of that cabinet. The Marey heater is sitting below on my DeWalt folding/portable workbench. ➜ Cabinet frame that I constructed today. A flash alert came over Little iPhone warning of a flash flood! warned area. This warning includes the city of San Diego. Beach, Ramona, Coronado, Alpine and portions of the San Diego city limits, and Mission Valley. PS: The Box Van team is in the City of El Cajon. Are you going to put inside some kind of containment in case of a leak or spill? Have your RVs had such a containment? Your comment seems to suggest that a Marey water heater is the new kid on the block. Maybe some kind of experiment? 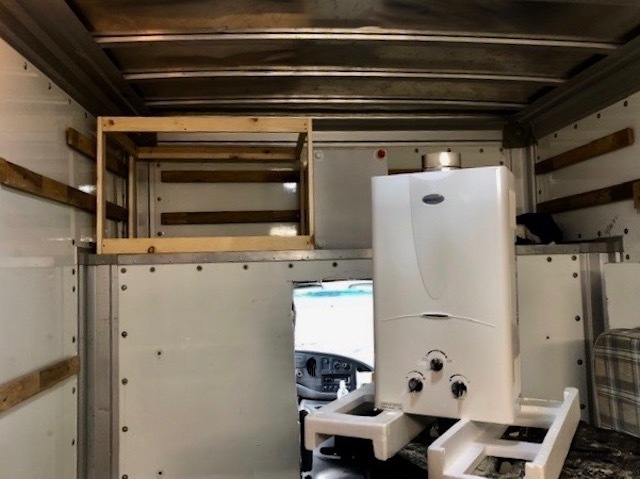 "Will my Marey water heater overwhelm my Box Van's environment with intolerable heat?" Is that it, Ed? Did I phrase your concerns accurately? Stop trying to read between the lines. I said it is a very good heater I did not say anything about failure. So feel free to go ahead and use it then after a week or so let us know how it works thank you ?? I may be installing the Marey very soon. It will go into the left overhead cabinet. After I get the Marey plumbed up to the fresh water line and the propane line. I'll be able to test it out. BTW, I have abandoned the idea of using a gravity feed for the water line. Instead I've opted for a water pump. Is the water heater going to be on the same plane as the tank? Are you still planning gravity feed? If so, it seems to me the water will have to flow uphill to get to the coil on the top of the heater. Once primed, it might flow, but will you need some pressure to overcome back pressure from water expamsion? You might want to test it before cutting the vent hole in the roof. Yes. My water heater is going to be installed in the overhead. My fresh water tank is already mounted on the floor of the overhead. The water heater and fresh water tank will be located only a few inches away from each other. I am going to use a pump to move water in my water system. Hi George, K.I.S.S. water heater = a tea kettle on stove top. why are you going through all this trouble ? you stated in other posts you dont/didnt shower in scampy, why start now with box truck ? even if you do want to start showering in truck, like I said, heat water in tea kettle and use from a shower bag or pump sprayer. water heater, water pump, permanent fixed water tanks, all nonessential items and will be future problems. Because I wanna have it. It's a fun thing for me!